Christendom College will award a record-breaking and historic twenty-four Master of Arts in Theological Studies degrees to graduates during this year’s graduate school commencement exercises on Saturday, July 30. During the ceremonies, which will begin at 11:30 a.m. in the college’s Chapel of Christ the King, the graduate school’s new dean, Dr. R.J. Matava, will bestow the academic hood on each graduate, signifying his or her master’s degree, before giving out the diploma. The twenty-four candidates for graduation, which include priests, religious, and lay people, are Adam Arehart, Stephen Donohue, Elliot Dorham, Vincent Drouillard, Mike French, Sr. Mary Augustine, Angela Hilbun, Zac Inman, David Jividen, Becky Jones, Mickey Krebs, Gregory Lugar, Ashley Roberts, Cindy Sebring, Monica Trevino, Jim Van de Voorde, Ryan Dent, Sr. Carol Hohmeier, Fr. Vincent Hulot, Thomas Kronholz, Gregory Pashley, Bryan Taylor, and Sr. Ann Marie Zierke. Advanced Apostolic Catechetical Diplomas will also be awarded to Gregory Lugar, Ryan Dent, and Gregory Pashley. Christendom’s graduate program offers students a faithful, flexible, and affordable education in theological studies. Students can attend classes at the Alexandria, Va., campus, on the Front Royal, Va., campus, or anytime online. Each of this year’s graduates completed their master’s degrees with a concentration in a specific discipline of study, either systematic theology, consecrated life, evangelization and catechesis, or moral theology. 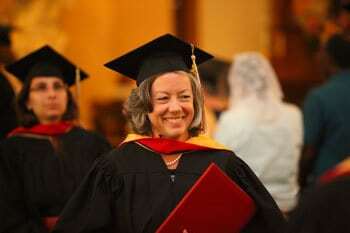 For more information about Christendom’s graduate school, please visit graduate.christendom.edu.